Maykel Blanco is one of the most talented young musicians in Cuba today. An excellent percussionist and pianist, he is also a talented composer and producer and at the age of 26 (at the time of this article) he is director of one of the fastest rising bands on the Timba scene: Maykel Blanco y Salsa Mayor. Maykel pursued amateur studies in percussion at Gerardo Guanche Conservatory and Amadeo Roldán. He then took up keyboard "by necessity" as he told Timba.com in an interview. He taught himself to play piano because he was dissatisfied with the arrangements that other people were doing . When you hear him play it's hard to believe he learned "empirically". His background as percussionist can be heard in his "percussive" piano style, which has won him fans around the world. 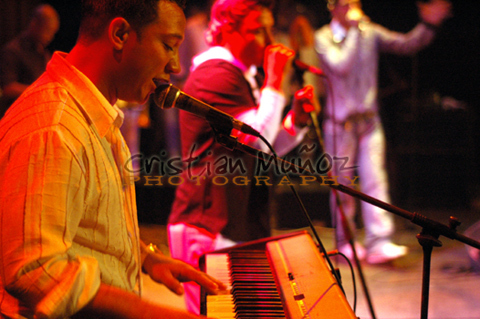 Maykel has been heavily influenced by classic timba such as NG La Banda, La Charanga Habanera and Los Van Van. In his early years, Maykel was part of such groups as Gen-Cortés, Abel y La Seducción and La Constelación before founding his first group at the tender age of 15. At 18 he started Maykel Blanco y La Suprema Ley. Maykel released one album with Suprema Ley, Llegaron los cubanos ( Envidia 2003) , composed and produced by Maykel himself. Llegaron los cubanos has a strong base in son, but also ventures into aspects of rumba and the elements we expect in timba such as gear changes and "attitude". One of the featured singers is Tirso Duarte and Maykel returned the favor by playing timbal on Tirso's CD, Si la vida te dice baila ( Envidia 2004). My personal favorite from Llegaron los cubanos is El veterano , which Salsa Mayor performs in the potpurri on the upcoming live album (Envidia 2007). On October 10, 2004 Maykel took over Javier Sotomayor's band - "Salsa Mayor" - renaming it Maykel Blanco y su Salsa Mayor. Maykel is the composer/director, arranger, pianist, corista and occasionally even sings lead. In 2005 Maykel Blanco y Su Salsa Mayor had already made a name for themselves in Cuba and in Europe, catching the attention of timba fans with humorous videos and with timba arrangements that demonstrated the maturation of Maykel's skills as a composer/arranger. Demos of their songs were on all the DJs playlists. There was an early version of their CD available only in Europe. It was called Si quieres, quiéreme , but it was in 2006 that they finally officially released their first wide-distribution album, Recoge y vete . 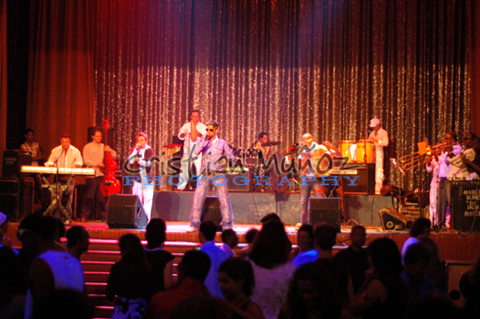 The new CD was an instant hit, making Salsa Mayor one of the most internationally popular groups of 2006. While he has participated in other projects such as jazz, Maykel's goal with Salsa Mayor is to make people dance and to win a place in the hearts of the dancers. He seems to be well on his way. The band has regular gigs at Casa De La Música Habana. I attended two concerts in Galiano and in both cases the dance floor was filled from the beginning to the end of the concert. For those who have been to Cuba you know that often the audience is a bit shy, or maybe jaded, about dancing and will usually wait a song or two before hitting the dance floor. But the grooves of Salsa Mayor get the dancers on their feet and keep them there. The band has a heavy rhythm section featuring drums with timbal, congas, percusión menor (bongo/campana/güiro), electropads (played by the lead trumpet) baby bass and of course piano and keyboard. The horn section is also strong with 2 trombones and 2 trumpets. The studio recordings even include violins and flute, and I think that Maykel would like to have a charanga format for the band, but for now these parts are coverd by the keyboard. The membership of the band has undergone many changes since it's formation and really Maykel is the only founding member that remains. But when looking for replacements for the singers he has made a point of looking for people whose timbre matches that of the original recordings so that the fans will feel familiar with the live songs. He has a reputation for requiring discipline from the band members, and this discipline is what makes this young band sound so professional, as if they've been playing together for years. Maykel Blanco y Su Salsa Mayor did their first major European tour during the summer of 2007. Europe was eagerly awaiting the chance to see this band live. In fact I have never seen an audience react like the audience in Paris did when Salsa Mayor performed there for the first time. There is no doubt that Slsla Mayor has quickly taken a place in the affection of timba fans. I had the good fortune to be able to follow the band on this first tour. Click here for an extensive tour report with interviews, behind the scenes video and concert video inluding a potpurri of the entire Paris concert. Maykel Blanco y Salsa Mayor arrived with their repertoire of hits from Recoge y vete , but also with new songs that this prolific composer had already written for the next album, Anda y pégate , which was released on Planet Records in 2008. 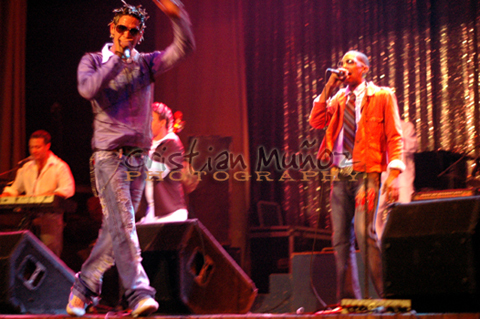 In June 2010 they released their third album: "Soy Lo que te hala". Click here for their discography page which includes CD reviews.